Atul Bhalla lives and works in New Delhi, and is also an Associate professor at the Shiv Nadar University at the department of Art Design and Performance. His recent solo shows include: “You always step into the same river” SepaiEYE New York 2015. “On the Edge” and “Ya Ki Kuch aur” Vadehra Art Gallery, New Delhi 2011 and 2014 respectively. “Water Works”, Grossman Gallery, Lafayette College, Easton. PA. USA Curation – Donna Gustafsson 2011. Recent group exhibitions have brought his work to Sepia International in New York, The Pompidou center, Paris, the IVAM Institute of Modern Art in Valencia, and the Devi Art Foundation in New Delhi. He is has shown his photographic work “Yamuna Walk” within “Other and me” Sharjah Art Museum, Sharjah 2014 and with “Walk On” From Richard Long to Janet Cardiff – 40 years of art-walking, Curated by Cynthia Morrison-Bell, at NGCA Sunderland.UK. He was also a part of “Floating World”- Curated by Geeta Kapoor; 50 years of Chemould Art Gallery Mumbai, India, April 2014. “Yamuna Elbe Project”, Hamburg-Delhi, Site – specific Installations on The Elbe in Hamburg, and On the Yamuna in Delhi. “West Heavens, Place – Time- Play”, India China Contemporary Art, Curated By Chaitanya Sambrani, Shanghai China, 2010. Installation of “I was not waving but drowning-II” at Harvard Art Museums, Cambridge, USA. December 2010-April 2011, and from end of this month, 31st March, the video installation “Adrift” (On the Dvaipayana) at the LightBox Gallery, Harvard Art Museums, Harvard, MA. He has published two books on his performative works, “Yamuna Walk” University of Washington press, Seattle and London and “What will be my Defeat?” GFLK Galerie für Landschaftskunst Hamburg. 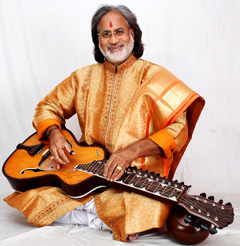 World-renowned Indian musician, and inventor of the Mohan Veena, and student of Ravi Shankar, he has performed with leading jazz musicians such as Terry Riley, Ry Cooder, and George Brooks. Recipient of the Grammy Award for his album “Meeting by the River” with Ry Cooder. He has performed in many international festivals, including the “Crossroads Guitar Festival” in California, with an audience of 35,000. Trained under Manju Mehta at the renowned “Saptak School of Music”, Amita also studied under Maestro Vishwa Mohan Bhatt. She has participated in many music festivals in India, Thailand, at the Moscow Olympics, and at other musical events in Germany, United Kingdom, Japan, and Austria. 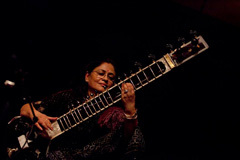 She has released three albums; “Sitar Lounge”, which is one of the ten top-selling albums in India. Mavin Khoo is recognised internationally as a dancer, teacher, choreographer, and researcher. He studied Bharatanatyam dance in India under the renowned Maestro Padma Shri Adyar K.Lakshman. He has also studied contemporary dance at the prestigious Cunningham Studios in New York and classical ballet with Marian St. Claire, and Michael Beare. He is currently Rehearsal Director of the Akram Khan Company and Artistic Director of the Maltese National contemporary dance company ZFin Malta Dance Ensemble. 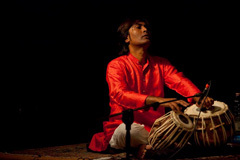 Accomplished tabla player, Nihar is from one of the most important Indian families of philosophers and musicians, and which founded the prestigious “Saptak School of Music”. In 2006, he founded “Saptak-India”, to promote classical Indian music in Europe, and in particularly in his adopted country, France. The association has contributed to the creation of many cultural events in France, Switzerland, Germany, Italy, and the United States. Ustad Kamal Sabri was initiated and trained by his father, sarangi legend Ustad Sabri Khan Sahab, from the tender age of five years. 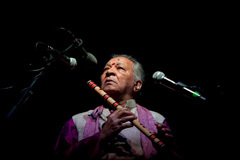 He has worked with veterans like Ustad Fateh Ali Khan, Ustad Zakir Hussain, Hossam Ramzy, Ricky Niles,, and Jan Garbarek . He has also recorded music with popular rock bands like Massive Attack and One Giant Leap. Kamal Sabri has been invited to several prestigious music festivals: the World Peace Concert di Delhi, Sangeet Natk Academy, Art of the Bow in Geneva, the BBC Millennium Concert of Birmingham. 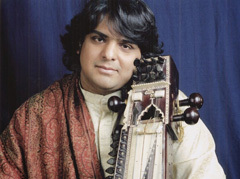 He has received many acknowledges, and many achievements to his credit including the privilege to be the youngest Indian musician to participate in “Les 24 heures du raga” in Paris.